The Ohio River Valley Water Sanitation Commission (ORSANCO) will be discussing and potentially voting on proposed changes to their Pollution Control Standards. The last chance to make public comments will be at this meeting of its Commission, where they will hold their official business meeting. There will also be a comment after the meeting to share your reflections after the meeting. Join members of Kentuckians For The Commonwealth, ally organizations, and other people who are working to protect and promote clean, healthy water for all who use the Ohio River - regardless of race, geography, or income level - by showing up at the Ohio River Valley Water Sanitation Commission (ORSANCO) Commission Meeting in Covington, Kentucky! Join us for a Water Justice Poor People’s Field Hearing. Across the United States, toxic water and unaffordable water bills are infringing on the basic human rights of poor people and communities of color. Since April of this year, KFTC members across eastern Kentucky have helped host energy efficiency workshops in their communities, as part of our ongoing Power House Project. KFTC's members attended today's Rally for Recovery in Louisville, hosted by PAR (People Advocating Recovery). It's an annual event organized by people in long term recovery from addiction to alcohol and other drugs, their families, and friends with the goal of building community and reducing the negative perceptions associated with addiction recovery. It has been PAR's experience that the road to recovery is filled with obstacles that hinder reintegration into society and one of those obstacles is felony disenfranchisement. Kentucky is one of just a handful of states where if someone is convicted of a felony, even something not serious enough to warrant one day in jail in some cases, they lose the right to vote for the rest of their lives unless given the right to vote back by a governor's pardon. That's not right. We think that all people should be allowed to vote and at the least, former felons ought to be given the right to vote back after they've served their debty to society. KFTC members were on hand at today's event to help people who could to register to vote and we circulated petitions to lawmakers to restore voting rights to former felons who have served their debt to society. 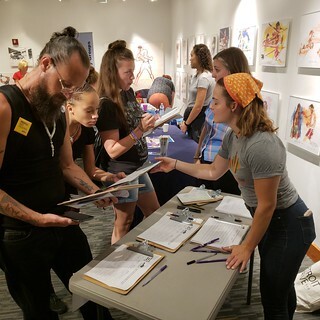 In all, we got nearly 300 petition signatures and several voter registrations, plus we connected with several key ally organizations and former felons who are willing to tell their stories to move this issue forward.